A new study by the European Central Bank on Friday sheds some much-needed light on the topic of cash use per household across the 19 euro area countries, and finds that across the EU, cash is king. The only other recent paper estimating the value and number of payment behaviour around Europe dates from 2008, making this ECB research paper essential reading material for policy makers, key stakeholders and journalists navigating the discussion on cash. 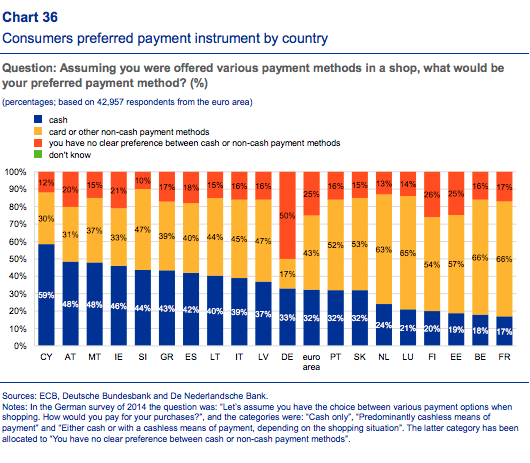 Looking at the survey results on preferences per country, it appears that Cyprus is the only country where the majority of consumers said that they prefer to pay with cash if they are free to choose between cash and cashless means of payment. Furthermore, in addition to Cyprus, in Austria, Malta, Ireland, Greece and Spain a larger share of respondents stated that they prefer using cash over cashless means of payment. Continue reading.. This is the first study on the use of cash, cards and other payment instruments by households that applies a harmonised methodology to analyse consumers’ payment behaviour in the euro area. It provides an objective measure of the use of cash and other payment instruments at POS in the euro area with emphasis on households’ daily payments, which tend to be small and often overlooked. The results give insight into the differences in payment choices in the 19 euro area countries.